Three years after California passed the Sustainable Groundwater Management Act (SMGA), groundwater sustainability agencies (GSAs) are now preparing to develop their groundwater sustainability plans (GSPs), the blueprints that will outline each basin’s road to sustainability. Successful GSPs will require an effective participatory decision-making process. We tested a participatory process with the Yolo County Flood Control and Water Conservation District, a water-limited irrigation district in the Central Valley. First, we worked with district stakeholders to outline the parts of the plan and set measureable objectives for sustainability. The district defined seven management strategies, which the research team evaluated against climate, land use and regulatory uncertainties using a water resources model. Together, we explored model results using customized interactive graphics. We found that the business-as-usual strategy was the most unlikely to meet sustainability objectives; and that a conjunctive use strategy, with winter groundwater recharge and periphery ponds storage, achieved acceptable measures of sustainability under multiple uncertainties, including a hypothetical pumping curtailment. 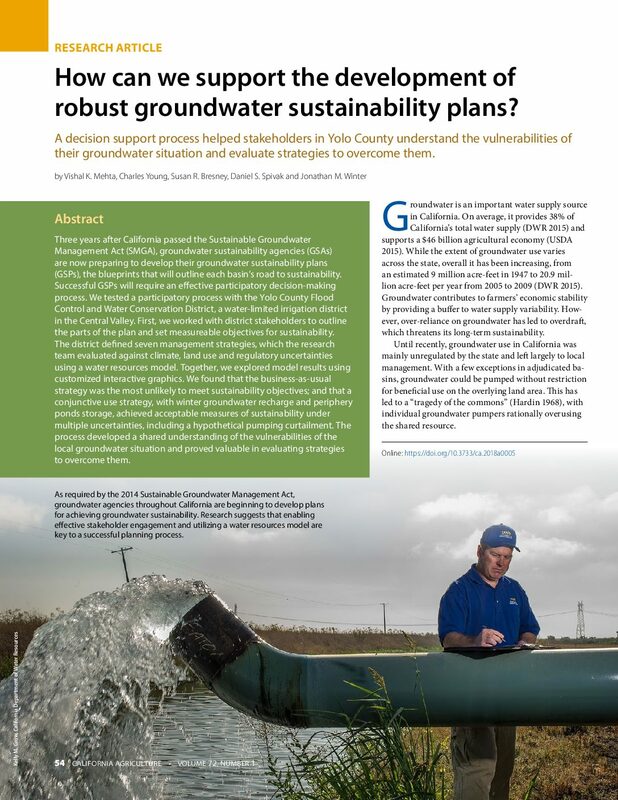 The process developed a shared understanding of the vulnerabilities of the local groundwater situation and proved valuable in evaluating strategies to overcome them. • Providing insight to decision-makers on the best approaches for water management. 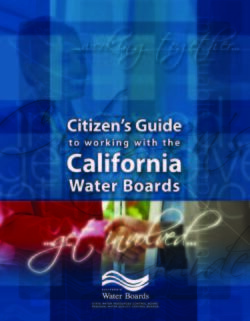 • Supporting activities that result in beneficial water management outcomes. • Promoting collaboration and interdisciplinary approaches to solving problems, as well as resolving conflicts and addressing multiple interests and needs. • Ensuring access to water management information and decision-making. For more than a century, California has benefitted from the exceptional technical knowledge used to select and build California’s significant water infrastructure. Water managers have relied on engineering expertise to achieve positive water outcomes and resolve problems. This approach worked well for meeting single-purpose engineering goals, which have supported a growing economy. Even so, some unintended consequences have been revealed. Over time, some water management projects have altered and degraded ecosystems and/or created social injustices as unintended byproducts. Because the water management profession remains primarily a technical discipline, and many agency staff are educated in engineering, economics, or law, these staff see their primary task as managing the physical system. Only later do they engage the public as a way of solving problems or developing policies and programs. As the demands on water management systems have increased and understanding of the complexity of the water systems has grown, the need for engineers and technical experts to engage others in achieving optimum results has become more apparent. Water managers’ new respect for the complexity of the ecosystems from which water projects draw has made them realize the need to access a broader range of expertise. Potential sources of expertise range from the close local knowledge of long-time residents of the area being altered by a water project (such as oral histories from local farms or recollections of historic streams, springs, and wells) to university scientists in disciplines (such as ecology) that have not always participated in water development and management. In addition, water managers are now developing new sophistication about the ways they can serve their communities. This goes beyond the traditional engineering approaches by bringing in expertise from other disciplines, such as economics, public health, and land use planning. 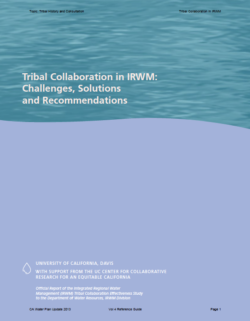 The Integrated Regional Water Management (IRWM) Tribal Collaborative Effectiveness Study evaluates Tribal participation in the Department of Water Resources’ (DWR) Integrated Regional Water Management (IRWM) grant program. The Department administers the overall IRWM program, and individual regions form Regional Water Management Groups (RWMG) develop IRWM plans and submit specific water management projects for funding consideration by DWR. Following indigenous collaborative research protocols, we conducted surveys, interviews and focus-group meetings with Tribal representatives throughout the state. While we collected data from Tribes statewide, our efforts were focused in five specific IRWM regions. The aim of our research is to identify strengths, weaknesses, and opportunities for Tribal participation in the IRWM program. 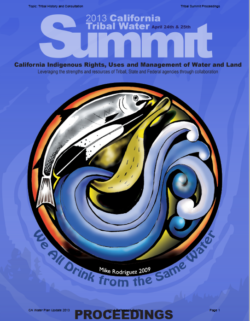 Two hundred representatives from California Native American Tribes, Federal and State agencies, and Native American organizations participated in the 2013 California Tribal Water Summit. »»Watershed Management and Land Use – looking at the integration of TEK and indigenous water rights with local, regional and statewide watershed efforts and projects which affect Tribal communities, trust lands and homelands. Three plenary speakers were featured during the Summit. On the first day, Heather Whiteman Runs Him, Staff Attorney for the Native American Rights Fund, discussed Tribal water rights principles and approaches. 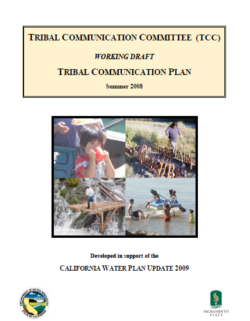 On the second day, Felicia Marcus, Board Chair for the State Water Board, reflected on the importance of establishing and maintaining relationships between agencies and Tribes. Also on the second day, Cynthia Gomez, Tribal Advisor to the Governor, provided an overview on the work of the Tribal Advisor’s Office. On Day 1, opening remarks were offered by John Laird, Secretary for the California Natural Resources Agency, and Dale Hoffman-Floerke, Chief Deputy Director for the California Department of Water Resources (DWR). Mr. Laird highlighted the efforts within the Resources Agency to better balance historic rights with multiple needs and interests. 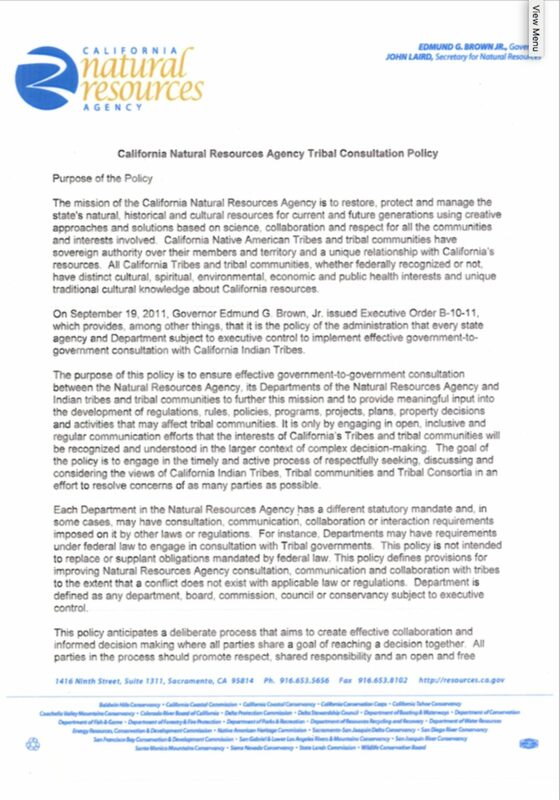 He shared the experiences from the MLPA Initiative, and described the adoption of the Tribal consultation policy and creation of the Tribal liaison positions. Ms. Hoffman-Floerke called attention to the TWS Guiding Principles and Statement of Goals for Implementation, which are supported by the Resources Agency and DWR. She described the 2013 TWS as succession planning, which supports the continuity of awareness, understanding and relationships from the 2009 TWS. 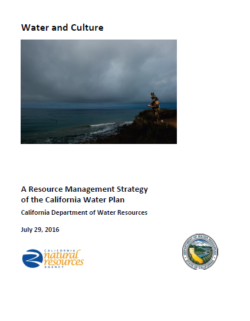 This resource management strategy report presents the emerging thinking of many California Water Plan Advisory Committee members and other stakeholders regarding the importance of linking cultural considerations to water management. In many respects, this resource management strategy report represents more of an annotated outline than a fully developed strategy. 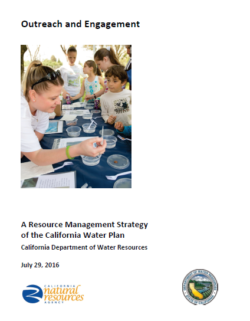 Even so, the water plan stakeholders asked that this resource management strategy report be included, if only to improve awareness of the need for the strategy and to continue dialogue on what it should include. 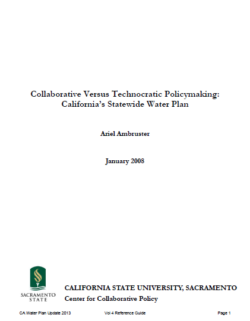 Water and culture are connected in myriad ways, with subtle and complex implications for water management in California. Some cultural relationships to water are so pervasive, they may be easy to overlook. Other cultural considerations are less apparent and may be difficult to recognize. Increasing the awareness of how cultural values, uses, and practices are affected by water management, as well as how they affect water management, will help inform policies and decisions. Even regulations reflect cultural values, particularly by how they are put into practice when water is viewed as a commodity, and all the more by the sum total of laws, regulations, and policies intended to control water. Water resources have shaped the history of California, contributing to the current social, cultural, and economic patterns across the state. The presence of freshwater sources has influenced the location of settlements and communities for hundreds, even thousands, of years. Water resources have also been pivotal to key economic activities, such as fishing, mining, agriculture, manufacturing, tourism, and recreation. These historic aspects of development continue to have ramifications for water managers today. Water and water-dependent resources also shape individual and collective experiences that contribute to individual and community well-being, sense of identity, and connection with the natural world. These experiences are inextricably linked to values, traditions, and lifestyles, which in turn inform perspectives and expectations regarding water resources and conditions. Cultural considerations by their nature are inherently linked to every resource management strategy. 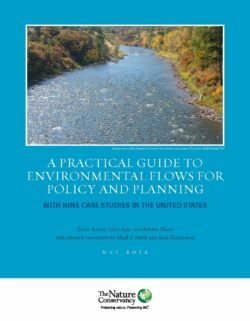 More importantly, the consideration of culture in water management decisions is, in many cases, legally mandated by State and federal laws. Utilizing cultural considerations in the framing, development, and promotion of management decisions is vital to ensuring legal compliance and sustainable practices.